The Central University Administration (CUA) supports the activities of the Academic Council and the Rector. It is headed by a Director and is directly subordinate to the Rector. Among the major projects of the CUA are: the system for career counseling of students, the system for consulting in international and research projects; series of training seminars for lecturers and administration; organizing and conducting university holidays; the NBU's information service through the university events promotion page and the coverage of publications for the University of the Media. The Director of the Central University Administration supports the activities of the Rector and Vice-Rectors. The Director manages the Central University Administration and the processes of research, quality and evaluation, career counseling of students, training activities, organizes the information service of students and lecturers. 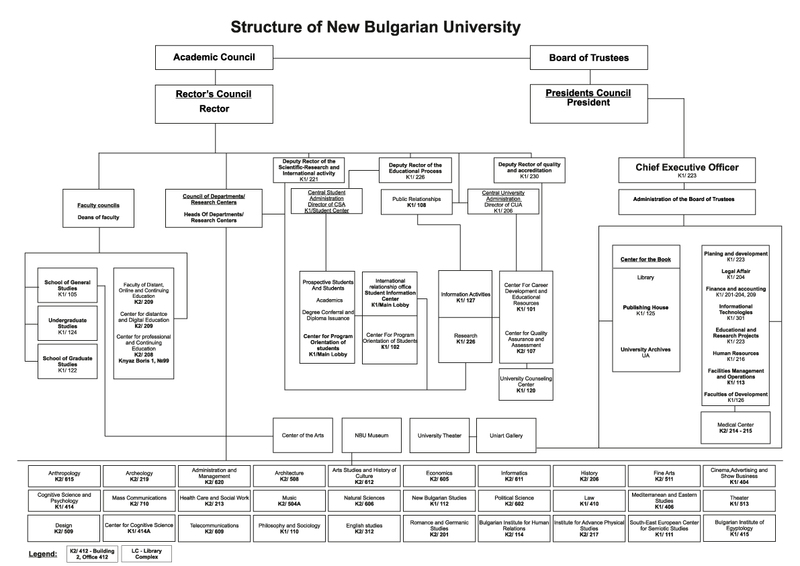 Organize and coordinate information flows at the University. Coordinates the conduct of university events - prepares information materials - invitations, posters. All events organized by NBU units or on the NBU's territory follow the rules approved by the Rector in Event Management and Event Management Conditions at the UniArt Gallery. Event Request and Event Request at the UniArt Gallery to the Rector and to the Executive Director. Coordinates relations with external organizations and media: selection and organization of information for electronic and print media and conducting of external events on the territory of the NBU. Develops standards and procedures for assessment and attestation at the NBU. Responsible for the preparation of the TOP and the evaluation of the candidate students of the NBU. Supports the development of current and final assessment at NBU courses. Organizes courses and practical training on topics related to quality improvement and teaching methodology. Standardizes the teaching techniques and skills used by lecturers at the NBU. Provides methodological literature on teaching issues. Assists the professional guidance and practical realization of the students through information, consulting and methodological activities. Coordinates activities with employers and branch partners. Organizes and conducts international events on career development issues. Organizes a Career and Student Selection Forum. Assists administrative scientific and creative activity of departments and centers of the NBU. Provides support for partner search and development of external financing projects. Tracks for the organization of departmental scientific and creative events (seminars, conferences, open lectures, exhibitions, plays, discussions, round tables). Assoc. prof. Orlin Todorov, Ph.D. The service provides professional support, consultations and psychotherapy for students and staff on issues related to coping with losses and changes, managing relationships and requirements, navigating through life crises and crises related to health and mental health issues.